Sticky Labels Blog | Company News | Custom Printed Paper Labels – Our Best Seller! Of all the labels we sell, the simplest always does the best: the custom stickers made from paper. They literally do just about everything and prices start from just £16.95 for 250. That includes 2 day print and dispatch time, along with free postage and VAT is included. A bargain! Never underestimate the plain white paper labels! They are particularly good if you want to print in full colour so you can have bright logos or information on there that is highly detailed, you can upload any colour image you like on our label designer. Just select a size and start designing! Equally, single colour print can look very effective and stand out. This may be ideal for things like barcodes, postage labels or address or basic information that needs to stand out. We supply our labels on rolls or sheets and you can even buy them unprinted and blank on A4 sheets for printing yourself or writing on. Sometimes you need a printed coloured and shaped label that can get a message across quickly. These work best with a single colour print and have a huge range of uses. For instance, it may be good practice to have a standard label shape and size in a range of colours to perhaps represent different levels of warning or different grades… Just like you have different coloured chopping boards in the kitchen. This could be ideal for laboratories or schools, maybe for the food industry or catering. 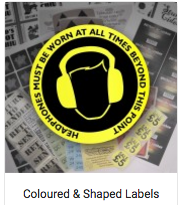 But that’s just the basic colours: We also provide fluorescent labels in radiant red and neon yellow along with metallic labels in gold or silver. Their applications are as diverse as your imagination will allow! 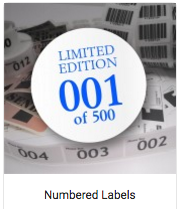 You may require labels that are consecutively numbered and we can print those! For example, we get a lot of orders from auctioneers who require labels with lot numbers on them. The beauty of our system is that you can include your logo, images or additional information on the sticker so it may be branded or form a number of extra uses that may not seem immediately apparent. Numbered labels can be ideal for limited edition items (like artwork) or keep track of the number of items you have installed (perhaps chairs or items that you rent out). 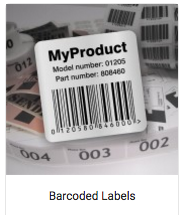 The great thing is, numbered labels can be combined with another favourite of ours, the barcoded label so you have multiple ways of tracking items using the information we can print on them. We see barcoded labels on absolutely everything these days but we rarely think about where they are printed! Not everyone is able to print barcoded labels as specialised software and printers are required to do so. We can print custom barcodes and text for you at low prices. Perfect for an unbelievable range of uses. Ask us for a quote on those. 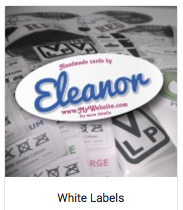 Along with the numbered and barcoded labels, we also print and supply postage labels. 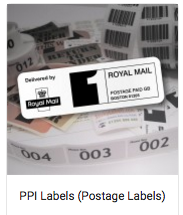 These can be simple address labels, return address labels, parcel labels or the PPI (Printed Postage Impressions) labels. They are another great use for printed paper labels and we print and dispatch these within 2 working days!